This week we are looking at the “X” shape and diagonal lines to the left/right in my pre-writing activities for kids series. So far we have looked at horizontal & vertical lines, circle shapes, cross shapes (+) and squares/rectangles! For the purpose of this series, I have combined squares and rectangles and right/left diagonal lines and X shapes since they are both very similar. Just keep in mind that depending on how old your child is, they may not be able to complete an X shape quite yet. They should be able to draw or trace a right or left diagonal line, without crossing over midline for the X shape however. 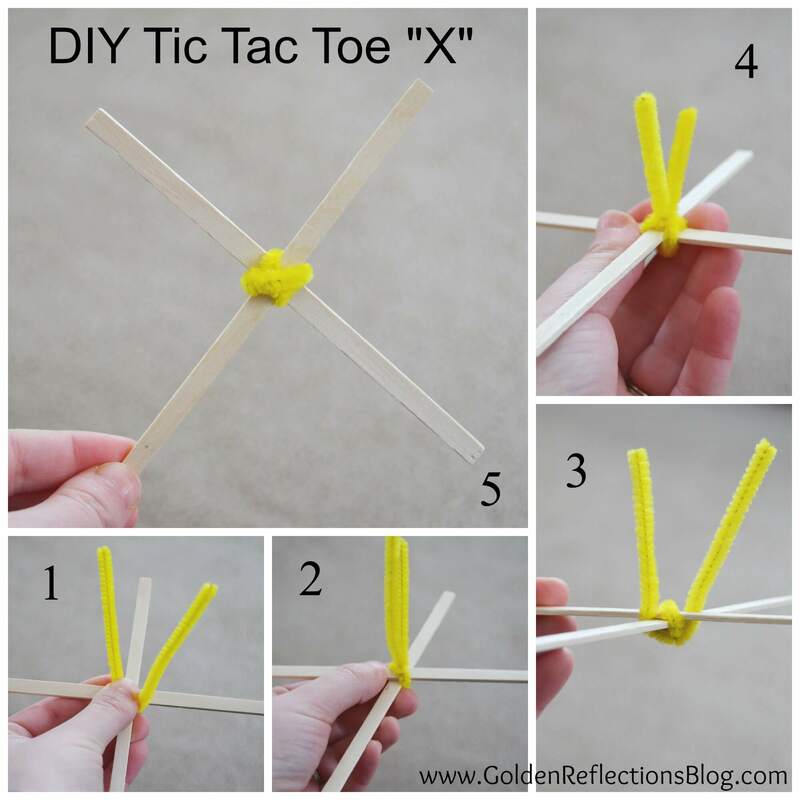 Today's activity is a DIY Tic Tac Toe game made out of wooden dowel rods, craft sticks, and colored pipe cleaners. At the end I am including a quick crossing midline activity for your younger ones (under age 3) who may not understand the tic tac toe game. First thing you are going to do is have your child make the tic tac toe board out of the long wooden craft dowel rods, like pictured above. This is great practice for crossing midline and also practicing the cross shape that we learned about a couple weeks ago! I did not have a task tray large enough for craft dowel rods, so I just put them on the carpet for the pictures. Then twist it a couple times and wrap it around the other two sides of the “X” shape (picture 2 & 3). Keep going until there are just two small pieces of the pipe cleaner left. Press them against one of the sticks and then you have your “X” shape! My daughter was playing with these quite a bit and they did not fall apart. Just make sure you are wrapping around each side in the middle and they should hold together pretty well! 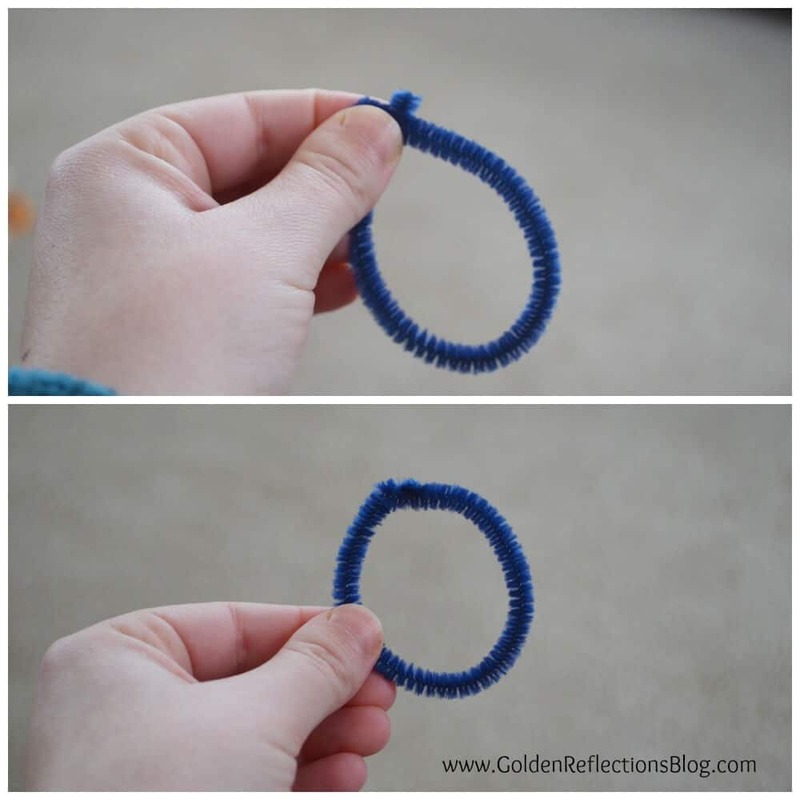 To make the circle shape, just take a colored pipe cleaner and barely overlap the ends. Then twist them together and flatten them along the side of the circle. If you have an older child (3 and above) you can have them try making both of these shapes. Just be prepared to step in and help if they ask you to! I would definitely let them try to do it on their own before you step in and help! 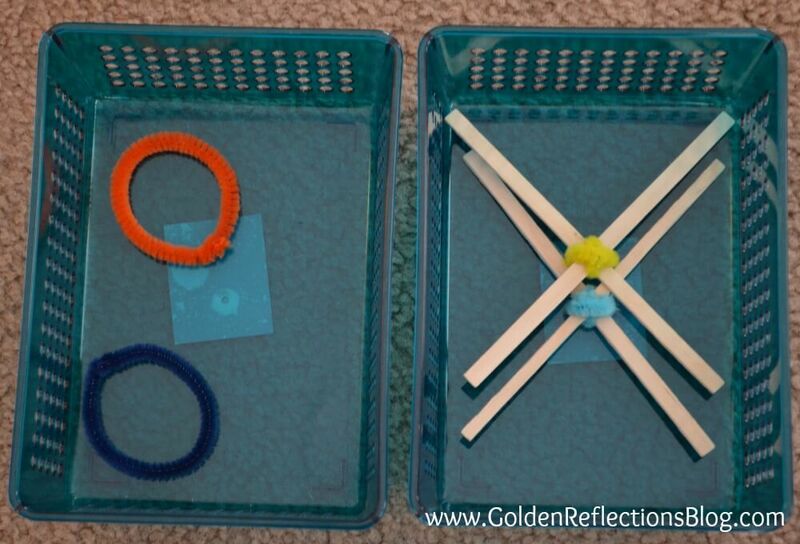 Once all my circle and “X” shapes were made I placed them into task trays like below. You could place them next to your task tray with the tic tac toe board on it and place it directly in front of your child with circle shapes on one side of them, the X shapes on the other side. Make sure they are sitting either at a child size table, or cross cross applesauce (indian leg style) on the ground. You could even have them lay on their tummies to get some good tummy time in as well! Lots of possibilities with this! Since my daughter is 18 months and doesn't understand the concept of the game tic tac toe, I made this into a quick crossing midline activity for her. I took all the circle and “X” shapes except for one each out of the task trays. I placed the “X” shapes on the opposite side of the task tray, next to her, and then the circle shapes opposite the circle task tray. I tried to have to pick up one at a time, but she just grabbed a handful of them, which is actually okay because she is only 18 months old. I had her pick up the “X” shapes with the hand they were next to and then she had to cross over her body to match them with the “X” shape in the task box! Same with the circles! I actually only had to give her a couple of visual or verbal cues on where to put them, she did really well crossing over and matching them correctly! So this activity can really be modified for children of ANY age! 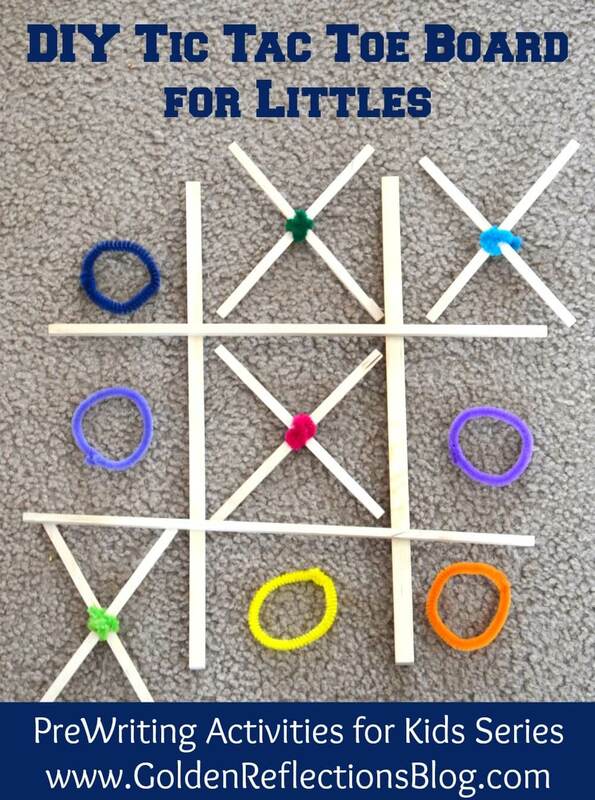 If you have a child who is under 3 and may not understand how to play tic tac toe, have them help you make the shapes and then do the crossing midline activity. If they are old enough to understand how to play tic tac toe, then have them build the tic tac toe board with the large dowel rods and play using the pieces you make! Pre-Writing Skills – Using objects to build an “X” and circle shape, which are shapes needed for writing letters. 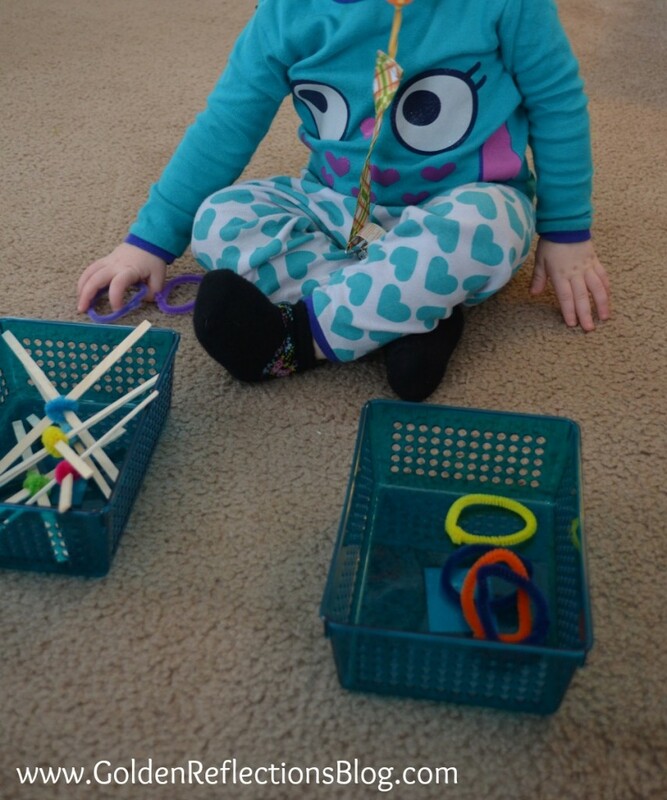 Bilateral Coordination – Holding the small sticks together to make the “X” shape, and also making the circle shape with the pipe cleaners. Crossing Midline – For your younger kids who complete the crossing midline activity, instead of the tic tac toe game. 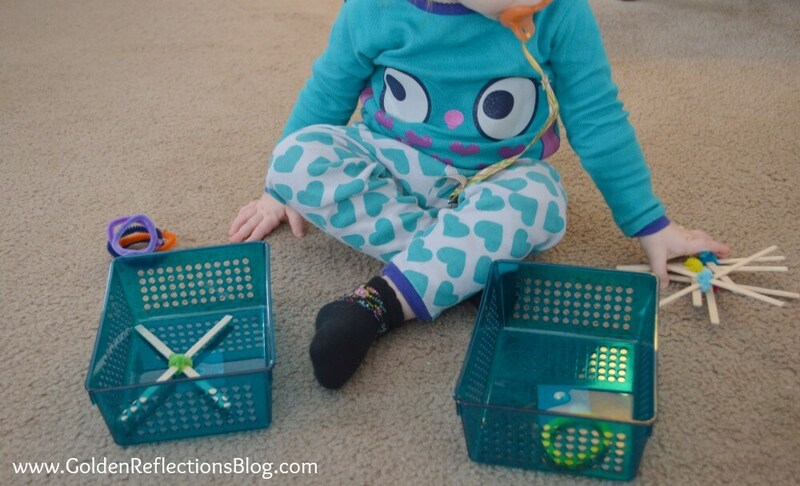 Eye Hand Coordination – Making the “X” and circle shapes, playing the tic tac toe game, completing the crossing midline activity for younger kids. Finger Manipulation & Strengthening – Twisting the pipe cleaners to make the “X” and circle shapes with the pipe cleaners. Follow Heather @ Golden Reflections Blog's board Handwriting Skills & Activities on Pinterest. Disclaimer: I am a Certified Occupational Therapy Assistant. The advise in these tips is not a replacement for medical advise from a physician or your pediatrician. Please consult their advice if you suspect any medical or developmental issues with your child. These tips do not replace the relationship between therapist and client in a one on one treatment session with a individualized treatment place based on their professional evaluation. Disclaimer: All activities are designed for complete adult supervision. Please use your own judgement with your child and do not provide objects that could pose a choking hazard to young children. Never leave a child unattended during these activities. Please be aware of and follow all age recommendations on all products used in these activities.